The NHL® rookie that everyone has been talking about in the 2016 Stanley Cup Playoffs is not a Calder candidate. In fact, he didn’t even start the season with his NHL® team. 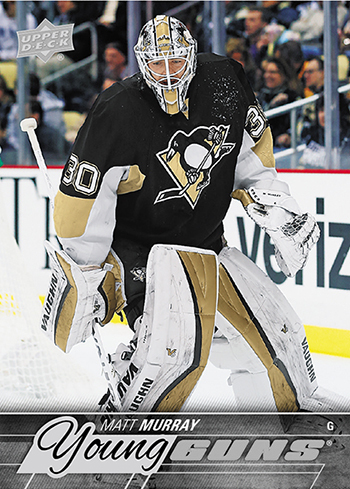 The rookie who got the most attention during the playoffs was Matt Murray; goalie for the Pittsburgh Penguins. He hails from Thunder Bay, Ontario so there are plenty of home-town fans for this 21-year-old goalie. In his first full professional season (2014-15), Murray set an AHL record for the longest shutout streak by not allowing any goals for 304 minutes and 11 seconds. 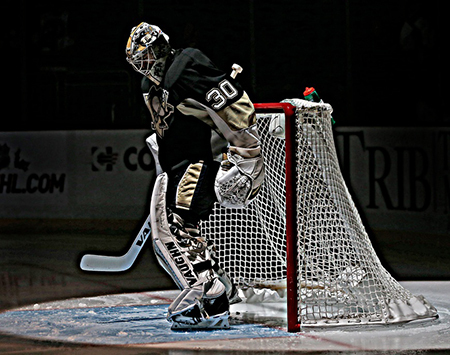 Can you say, “Stone Wall?” He finished that season with 12 shutouts. For the 2014-15 season he swept the AHL awards as he was selected as he won theBaz Bastien Memorial Award as the League’s best goaltender and the Dudley “Red” Garrett Memorial Award as best rookie. He has XRC trading card content in Upper Deck’s AHL set and the cards have been performing very well given how little is out there for Murray so far. He was called up to the NHL a couple times this season and on December 30, he showed some of his skills against the Toronto Maple Leafs. 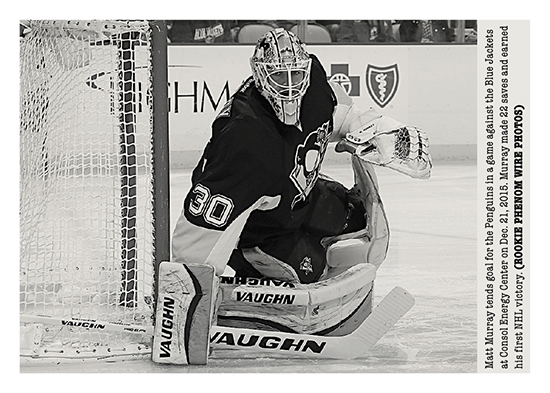 He finished the season red-hot and in Game 3 vs. the Washington Capitals he stood on his head with 47 saves helping the Pens take a 2-1 lead in the series. The feedback on social media was overwhelmingly positive for the young star. 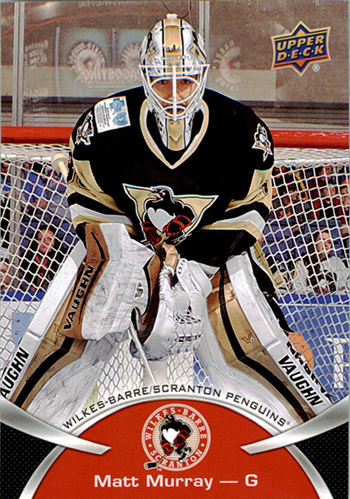 You won’t find Matt Murray cards in every Upper Deck release making them a bit more scarce and rare across the board given how late he was called up. Luckily there will be some updated cards in products like 2015-16 NHL SP Authentic and 2015-16 NHL UD Portfolio for earlier season releases. 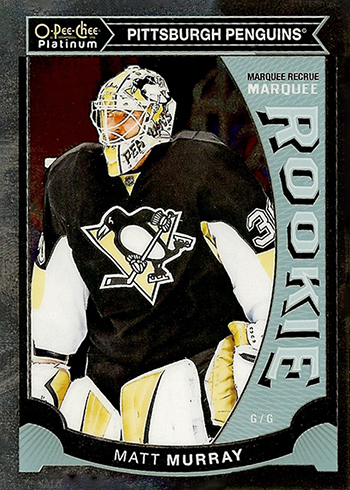 Murray will have Upper Deck Young Guns rookie update cards inserted in 2015-16 NHL SP Authentic. 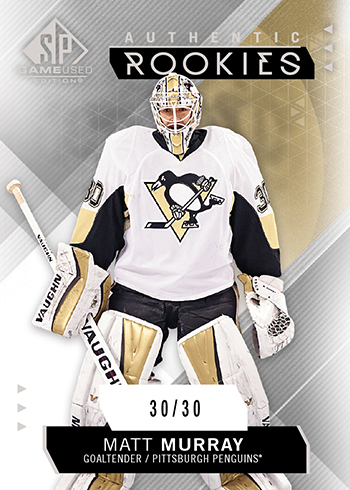 Murray will have SP Game-Used update cards in 2015-16 NHL UD Portfolio out this summer! He led the Pittsburgh Penguins to the 2016 Stanley Cup Championship. 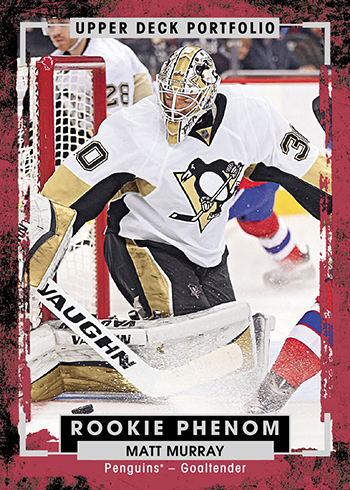 Not many rookies get their own Stanley Cup Champion trading card, especially goalies, but Murray will now have his! 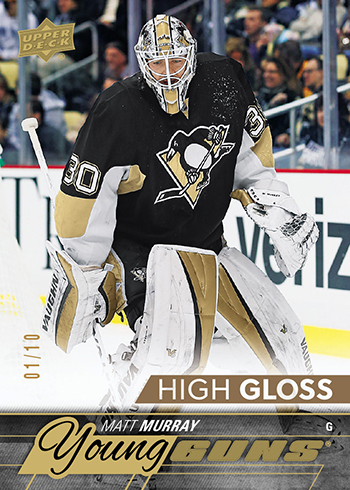 When it comes to which cards of Matt Murray to collect, many are just hitting the market this season. While others are collecting Connor, think strongly about collecting Murray. 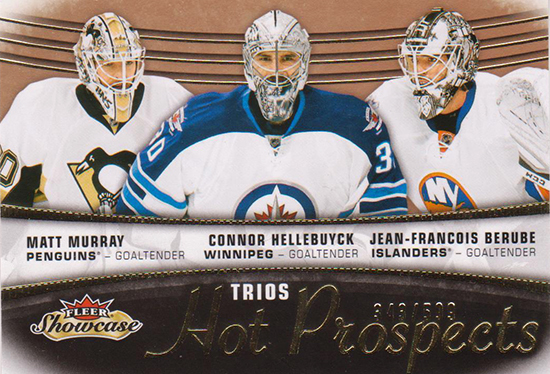 Murray’s first NHL licensed card came out in 2015-16 NHL Fleer Showcase where he appeared with two other solid goalie prospects. Murray will have a variety of content in 2015-16 NHL O-Pee-Chee Platinum which is available in stores now! Murray will also have UD Exclusive Young Guns cards numbered to 100 and High Gloss Young Guns cards numbered to just 10 copies in SP Authentic. Murray will have some rookie content available at a lower price point in UD Portfolio. Wire photo inserts of Murray commemorate key moments from his rookie campaign. Higher-end rookie autograph content for Murray will be available in releases like Premier during the summer.